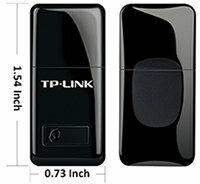 With its mini-sized design, you can connect the TL-WN823N adapter to the USB port of your computer without worrying about blocking adjacent USB ports or that the adapter may fall out when moving the connected computer. It is also easy to carry the adapter due to its small size. The ergonomic design of the body of the adapter makes it esay to hold and pull the adapter off. The TL-WN823N complies with wireless 802.11 b/g/n standards and transmits data at up to 300Mbps. 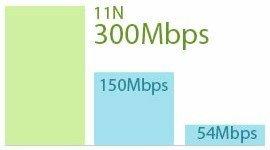 It adopts the Mutiple Input Multiple Output (MIMO) and Clear Channel Assessment (CCA) technologies to provide better wireless performance and stability than previous generations. The adapter supports WEP, WPA/WPA2, and WPA-PSK/WPA2-PSK encryptions. If your computer's operating system doesn't install the driver of the TL-WN823N automatically after plug-in, you just need to install the driver from the bundled CD or from TP-LINK's website. After the driver is installed, you can use the built-in wireless utility in your operating system to connect to a wireless network. If you want to use advanced features of the adapter such as Soft AP, you can install the TP-LINK utility to access those functions. Whenever there is only wired Internet connection, you can activate the SoftAP function of the TL-WN823N after installing the bundled utility software, and create a Wi-Fi hotspot for mobile devices. This feature is useful when travelling to places where there is only one cable for Internet and mutiple people have to use the Internet. NOTE: IN STORE PICKUP ONLY.